Your item(s) will be shipped out about 4 - 6 weeks from the date of completed purchase. You will receive an email shipping notification the day it is shipped. ♥ WHY IS THE SHIPPING TIME SO LONG? I have 3 other jobs and this is the only way to keep the shop open and affordable. This is a one-woman-shop and all these are “Made to Order”. If I have more time, I may send out the order sooner. ♥ More details about refunds & exchanges, click on the Shipping Tab above. : Message what size you want during purchasing process or it will be on hold. 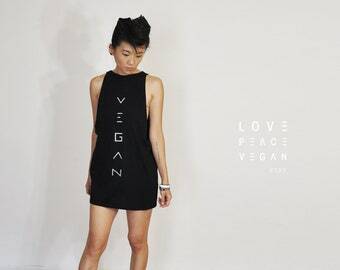 This clothing line is not intended for profit. Proceeds go to several charities like Ocean Conservancy, Humane Society, Nature Conservancy, Savethechildren.org, and more! 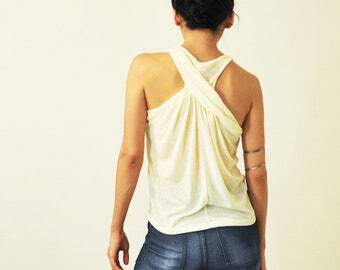 : Each piece of clothing is unique & ONE-OF-A-KIND with its own custom hand-made graphic! 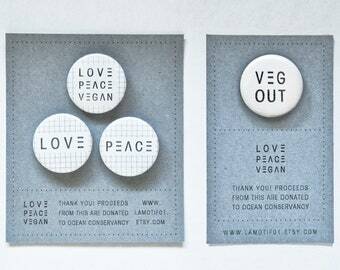 ♥ WHY THIS VEG-SHOP WAS MADE? This veg-shop was created to raise awareness for those that cannot be heard, help save our animal friends, the health of humans, and help our Mother Earth. 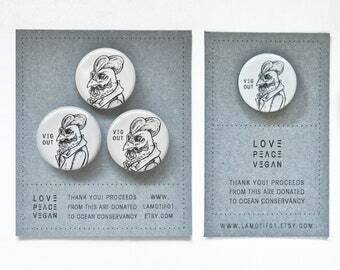 This shop is not intended for profit, but to find a way to donate to charities. I sincerely want to try to help in my own way and your support helps this dream come true . . . dreaming of “World Vegan. World Peace”. My boyfriend really loves this shirt and the seller was incredibly kind in preparing it for him. She was very responsive and helpful about size queries. We also love the free LOVE PEACE VEGAN bracelets she included in the package and we both still wear them every day. I love it!!! Will post picture soon!! Thanks so much!!! 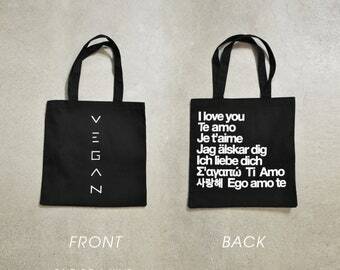 Wonderful vegan messaging! This wristband is very sturdy while also being attractive and super comfortable to wear. The quality is excellent and the price is very reasonable. I highly recommend buying multiple sets and giving them as gifts to other compassionate vegans! I am complimented constantly on this fabulous vegan wristband and so thankful and that I found this awesome vegan seller. Many thanks! We only accept three forms of payment: Etsy Gift Certificates, Credit Cards, and Paypal. Production and delivery cannot begin until full payment has been received. If you receive your order and find it not to be what you expected, you may exchange it within 1 week from the date you received the item. Unfortunately, you will have to cover the shipping cost to send it back. I'll make a refund or exchange after we receive it back. The item(s) are non-refundable after 30 days from the date customer receives shipment notification, the day the item is shipped. --- CLOTHING & TOTES: Shipped 4 - 6 weeks after completed purchase. --- WRISTBANDS : Shipped 1 - 2 weeks after completed purchase. --- HAIR CHAINS: Shipped 4 - 6 weeks after completed purchase. --- BUTTON PINS : Shipped 2-3 weeks after completed purchase. ♥ If you purchased any accessories with clothing it will be 4 - 6 weeks. ♥ If you ordered 3 or more clothing items, it will take an additional 5 - 7 days. I have 3 other jobs and this is the only way to keep the shop open and affordable or I have to close it again. This is a one-woman-shop and all these are “Made to Order”. If I have time, I may send out the order sooner. ♥ Shipping is from Phoenix, Arizona, USA. ♥ You will always receive a email notification the day it is shipped. ♥ I do sincerely apologize for the longer wait time, but to make the clothes affordable (not for profit), keep the shop open, & work my other 3 jobs, the production & shipping time is longer. The last time I closed shop was one year from June 19, 2014 – June 20, 2015 and I don’t want that to happen again. Thank you for your love & understanding. 1.) I always send small packages through First Class via USPS. If it over one pound, it will be shipped Priority via USPS. 2.) Domestic shipping includes packaging, handling, and email notification. Tracking #s for clothing only, not bracelets and are given upon requests. 3.) International shipping in packaging and handling with a confirmation # that states when it arrives within the country. Confirmation #s are only given upon request. - The starting price for any weight, even 1 oz is about $13 or higher. I am sorry the shipping fee is so high. - Shipping time can vary 2 to 10 weeks depending where you are. For example, it took 3 weeks to Japan, but 7 weeks to Australia. ♥ DO YOU NEED IT RUSHED? If it is a gift or rush order, I typically cannot rush it due to my busy schedule, however, please message me and let’s see what we can do. I always try to purchase an additional tracking number service if allowed at the US Postal Office for clothing only. I do not include it for the bracelets. The tracking numbers are only given upon request. Sometimes the postal service is slow and we can't help how long an item can get hung up in customs for international items, so please allow about 1-3 weeks for delivery. (in rarely 4 weeks, mostly for Australia). These items are not intended for profit, but to help our Mother Earth, animals, healthier humans, and many lovely charities! 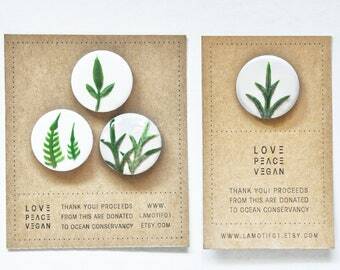 By wearing these, you have contributed to several charities like Ocean Conservancy, Humane Society, Nature Conservancy, Savethechildren.org, and more!